The kidneys, which are beneath the two major back muscles, are the residence of original jing (yuan jing). When the kidneys are healthy and strong, your original jing is retained and strengthened. Only when your kidneys are strong will they be able to generate original qi (yuan qi) and enliven your body. The following excerpt is an explanation of standing brocades exercises six, seven and eight. 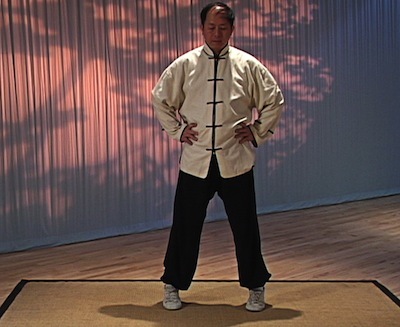 For the previous exercises read “The Standing Brocade Exercises 4 and 5” and “The Standing Brocade Exercises 1, 2, and 3”. Translation: Two hands hold the feet to strengthen the kidneys and waist; (when the) kidneys and waist are strong the entire body (is) strong. Bend the waist and hold the feet. (This is the) most effective way to strengthen the muscles/tendons and bones. One down one up, the life force greatly increases. (It is) the best way to prevent colds. The kidneys, which are beneath the two major back muscles, are the residence of original jing (yuan jing,). When the kidneys are healthy and strong, your original jing is retained and strengthened. Only when your kidneys are strong will they be able to generate original qi (yuan qi,) and enliven your body. When you bend forward and use your hands to hold your feet, you are tensing the back muscles and restricting the flow of qi in the area of the kidneys. When you release this pressure, the qi flow will resume, removing any qi stagnation. This exercise is an excellent way to massage the kidneys and increase the flow of qi there, as well as in the back muscles and the spine itself. When the kidneys are strong, the original qi will be strong. When original qi is full and strong, your body will be able to generate a strong shield of guardian qi (wei qi,) to protect you from the cold. When you are bent over you are lightly stressing your whole body, and in particular, you are stimulating your kidneys. When you straighten up and extend your arms, your mind is thinking of stretching out to your hands and feet. This action of the mind and body leads the qi out to all your tendons. When you are bent over, part of your attention (and part of the qi from your kidneys) is drawn to your sacrum. The qi will enter the spine through the holes in the sacrum, and when you stand up it will pass through the spine. Eventually the qi will move through and vitalize your whole skeleton. Assume a natural standing posture with your feet shoulder-width apart. Press both palms down slightly beside your waist. Move your hands up in front of your chest. Continue to move your hands above your head with the palms facing up. Hold the posture for three seconds. The form looks as if you are holding or lifting something above your head. Your mind is on your mingmen cavity (Gv-4) in the kidney area. Bend forward with the arms extended. Grab your toes and hold your feet. Pull your hands up slightly so that you are putting a gentle stress on your whole body. While holding your feet, your mind is on the bubbling well (Yongquan, K-1) cavity. Hold the posture for three seconds. Perform the entire process sixteen times. Screw the fist with fiery eyes to increase qi-li; body and mind healthy, the spirit of vitality comfortable. Ride the horse and squat down, straightening the chest. Hold the fist or strike with palm, using more force. Left and right, two hands grasp in turn. Grasp, hold, fiery eyes, use li-qi. This piece is very similar to the second piece. From a natural standing posture, step your right foot to the side and squat down in a horse stance, holding your body erect and your fists beside your waist. Tighten both fists, and extend one arm to the side in a twisting punch motion (screw the fist). Your other hand stays beside your waist in a tight fist. The hand that is out can be either a fist or an open palm. When you make the punching motion, glare fiercely at an imaginary opponent. After you finish the extending movement, loosen both hands and bring the extended hand back to your waist to the starting position. Repeat on the other side. Tighten both fists, extend one arm to the side in a twisting punch motion (screw the fist). Your other hand stays beside your waist in a tight fist. The hand that is out can be either a fist or an open palm. When you make the punching motion, glare fiercely at an imaginary opponent. Do eight on both sides for a total of sixteen repetitions. This piece trains you to raise your spirit of vitality. When your spirit is raised, you strengthen the qi flow and also increase your muscular strength (li). Muscular strength that is reinforced by qi is called qi-li or li-qi. As you raise your spirit (shen) and increase your qi-li, the qi will fill your body all the way out to the skin. In the other exercises, you have been focusing your attention and concentrating your qi. It is important to now do this piece because it clears out any stagnant qi and leads it to the skin. Concentrating your yi is the key to success. If you have a very strong mental image of punching someone very hard, your yi will lead your qi out to the ends of your arms and legs to make the punch powerful. Seven disorders and hundreds of illnesses disappear and are left behind your back; hundreds of illnesses are caused because the body is weak. The feet up, achievement is hard to describe by pen. Keep the head up and press down to reach to the end of the toes. Hold the waist and hold the chest, up and down movements. (It is) effective in getting rid of sickness and eliminating disasters (illnesses). There are three parts to this exercise. The different hand positions serve different qi circulation functions. First, drop both hands down naturally, beside your body. Stand still and keep your mind calm. Rise up on your toes and stay as high as you can for three seconds, then lower your feet to the floor. Perform the motion twenty-four times. Place your hands on your waist. Thumbs forward and fingertips pointing to your spine. Raise yourself up on your toes for three seconds and then let yourself down. Do this twenty-four times. This piece is used to smooth out the qi from the top of your head to the bottom of your feet. When you raise yourself up on your toes, you are stimulating six of the qi channels, which are connected to internal organs. The three hand positions, which are the same as in the fourth piece, help to regulate the qi in different parts of your body. 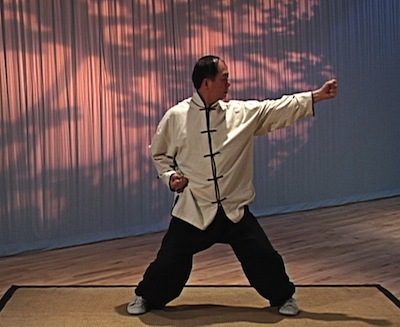 In conclusion, Chinese qigong has a number of different styles, or schools, which come from different sources. One style, which was developed by scholars and is now practiced by the general populace, is devoted to maintaining health. A second style developed by Chinese doctors concentrates on healing. A third style was developed in the Buddhist and Daoist religions to help the devotees reach the goal of immortality. This style seeks not only to improve and maintain health, but also to lengthen life. Once you become familiar with the Eight Pieces of Brocade, you will find that it is a very simple, but effective way to maintain your health. You may also notice that, unlike the sets developed by doctors and monks, breath coordination is not essential in most of the pieces. The Eight Pieces of Brocade follow a few simple principles, but they will lead the interested practitioner down the right path to discover what qi is all about and will also improve health. 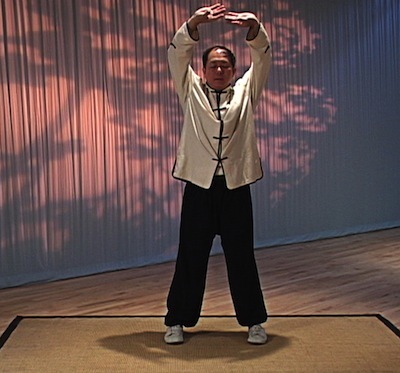 I hope this simple set of qigong practice will help you to have a healthy life, and encourage you to get involved in further qigong study and research. If you have obtained benefit from this set, please introduce it to your friends and help them to improve their health.